So another new year is upon us and THHN has lots of amazing plans for 2017. We hope you have too. But first we cast a look back to the fun, festive, fundraising and family-focused (that’s a lot of Fs!) things we did in December, finishing off a bumper year for our fantastic little charity. It also shows that what we have is far more than a charity – THHN has created its own community, a community that not only helps families but feels like family! Early in December, Marldon Christmas Trees invited a group of local THHN families along for a very special seasonal tour of their beautiful farm. The visitors were treated to a special meeting with Father Christmas himself, followed by a land train ride around the farm, where they met all the resident animals. Some very special festive memories were made by all, so a huge and heartfelt thank you to Marldon Christmas trees and our wonderful holiday liaison officer Annemarie, who coordinated the even with all the families. 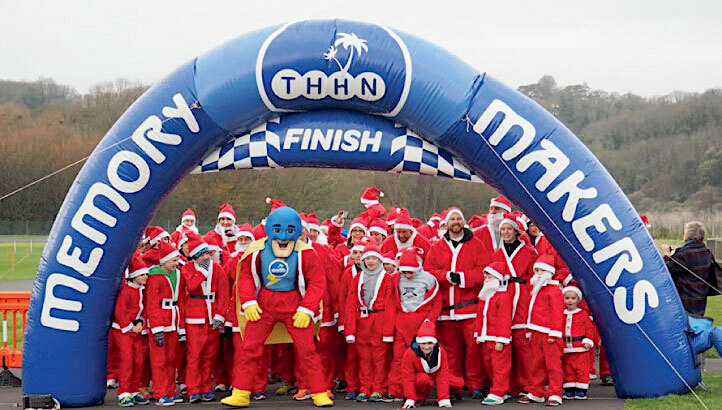 THHN’s Santa Sunday took place on 4 December, giving entrants the choice of a fun run, cycle ride or duathlon at Torbay Velopark – Santa outfit a must for all three. Scores of competitors braved the cold, including THHN’s own Memory Maker Man and Peppa Pig. A massive thank you to Pennywell Farm, the event’s sponsors, and to all the participants and volunteers. Following hard on the heels of the Santa Sunday was THHN’s Christmas street party on 7 December in St Marychurch, home to our Memory Makers Shop. The event was a roaring success, featuring live music and entertainment, stalls, Rodeo Reindeer, Santa’s Grotto, snow machine, lantern parade and late-night shopping. A huge thank you goes to everyone involved, including The Dolphin, St Marychurch Rent Agency, Babbacombe Model Village, Langs, the Ukulele Strummers, Anita Kingsley and Ray, Steve Laister, Lindsey Collard, Nicola Farleigh, New Daze, the children and teachers from Cockington, Watcombe & St Marychurch primary schools, TSB in St Marychurch , Riviera Mascots and Bounce Torbay, Party Like a Princess, Pennywell Farm, the chairman of Torbay Council Ray Hill for leading the lantern parade and all the schools who took part in it, Paul and Gail at Photo Matters Torquay, Zoe from Black Cat Books, Hallets and, last but not least, the St Marychurch Experience. In December Copy Print & Design from Torre, Torquay set up an appeal for new toys and games to go underneath their Christmas tree to be passed on to THHN families. Just before Christmas they gave all the donations to THHN, to be presented to the children of the families who we help in 2017 as an extra treat when they have a memory-making holiday. Thank you so much for this thoughtful gesture. A team of 15 THHN runners proudly took part in the Cockington Caper on 10 December, wearing their running tops while taking on eight very muddy hills around Cocklington. We were thrilled that the organisers the Barnabas Sports Trust and Cockington Caper race director Matthew Day had chosen THHN as the event’s charity. Matthew Day presented THHN fundraising manager Brian Lewis with a cheque for £369 just before the start of the race. A heartfelt thank you to our amazing friends at Pennywell Farm, who and raised a super £328.57p for THHN from their magical annual charity nativity play, complete with live animals. A wonderful time was had by all and some magical festive memories were made. It was beginning to feel a lot like Christmas when Brixham Ladies Forum invited THHN founder Luke Tillen along to their annual festive gathering and presented him with a cheque for £250. This generous donation will go directly towards furthering our work in creating very special memory-making holidays for families who are living with serious illness or bereavement. On 17 December, Paul Pickett, who runs With a Difference Entertainment, popped into THHN HQ to make a very special presentation to founder Luke Tillen. He handed over £500 he had raised by holding charity horse-racing evenings at a local hotel for the second time this year. Paul is THHN Celebrity Ambassador Bruce Forsyth’s nephew and, like Bruce, Paul is passionate about THHN and the work we do. What incredible support – we appreciate it hugely. The first ever Pennywell Pursuit, a 10k trail race and fun run will take place on Sunday 30 April. It will be organised by Pennywell Farm and THHN, with £5 from every entry coming straight to THHN. The challenging route will run through the beautiful South Hams countryside and is all off road, taking runners across on private farm land and woodland, with the start and finish line at Pennywell Farm, near Buckfastleigh. As well as some spectacular scenery, there will be hills, possibly mud and a few animals to see as you run back through the farmyard. There will also be the Pennywell Pursuit 1- mile fun run for all ages. All finishers of the 10k run will receive a bespoke Pennywell Pursuit Piggy medal and there will be a piggy medal for all fun run finishers. Whether you’re 4 or 40 – or much, much older, there is a wealth of opportunities to raise money for THHN at this year’s Torbay Half Marathon on Sunday, 25 June at Paignton Green. There are Team THHN charity places available, while the THHN Schools Challenge is also back this year, offering school children aged between 4 and 11 the chance to take on their own Half Marathon Challenge. Why not get your school involved? For further details, please email fundraising@thhn.co.uk. And we’d like to send our thanks to Medworth Plumbing and Heating, who came to the rescue to fix the boiler at our caravan where the family were staying.